Getting a tattoo is some exciting stuff — you leave the tattoo parlor feeling like you got a work of art on your body, one that shares a part of your personality and aesthetic with anyone who glances at it. But all that can hit a wall when your tattoo gets infected. You no longer feel like rolling up your sleeve and winking at people while you show off your ink — instead, you'd rather just stay in your room and cry. The good news is, that scenario is totally preventable. "Getting an infection is not a very common thing for people who get tattooed in legit places and follow the instruction given by the artist after the tattoo, but it can happen in some cases," Camille Francoeur Caron, a tattoo artist of two years from XS Tattoos in Montreal, explains in an email interview with Bustle. But it can be worrisome once it does happen, so you need to be prepared to jump into action once you notice the signs. 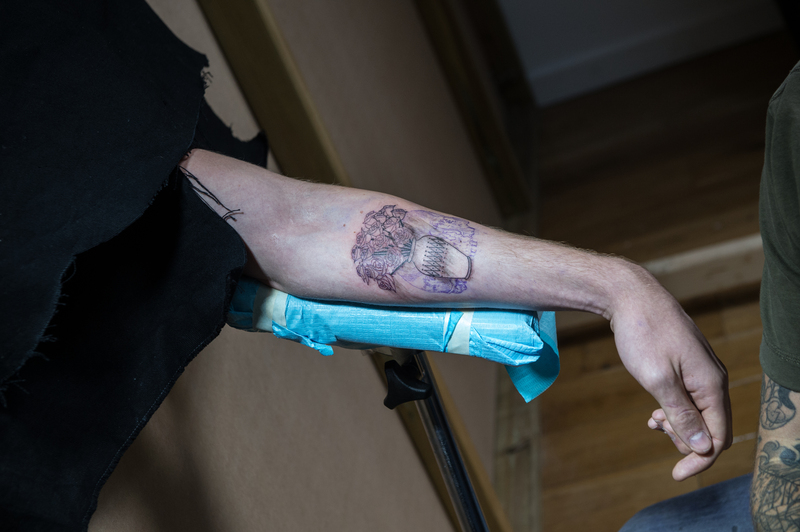 "As a tattoo is like a wound, it is normal for a tattoo to get a little scary and itchy, but you should always check for any weird color, redness that expends around the tattoo quickly, excessive pain or burn sensation and excessive swelling," Caron shares. While scabbing and redness might be normal, anything that feels remotely off should raise a red flag. But before you rush yourself off to the ER, you might save yourself a big bill and check in with your artist first to see their impression. "If you ever have ANY question regarding the healing of your tattoo, or suspect an infection, you should always contact your artist as quick as possible to make sure everything is ok, and that if not, they will give you the best instructions on what to do," Caron confirms. If something looks too funky and they think you might need medical treatment, they'll point you in that direction. But sometimes the remedies are simpler and cheaper than a doctor's inspection. The important thing to do in this case, though, is not to hop onto webMD. "NEVER listen to your friends/google/anyone that is not a doctor or a professional tattoo artist working in a professional place regarding what to do with you tattoo, whether it’s infected or not," Caron stresses. You might find a quick do-it-yourself remedy with household products on YouTube, but keep in mind you're dealing with an open wound. It's not worth trying to fix it yourself and escalating the issue. If you're curious on how to keep your ink clean and not lead you down a scary path of pus and infection, make sure you pay close attention to your artist's instructions. "Make sure that after the tattoo is done, you follow the instructions given by the artist regarding how to take care of your tattoo. No touching with dirty hands, no letting your friends touch it, no swimming in a dirty pool the day after," Caron recommends. In the end, the easiest thing you can do is pop back into your parlor and get your artist's opinion. They have your back, before, during, and after the ink has been committed to skin.